Report by Paula Antolini, March 31, 2019, 6:38PM EDT. Bethel Advocate received the final documents via our FOIA request, from the State Elections Enforcement Commission (SEEC) for File No. 2018-102 regarding the complaint against Raghib Allie-Brennan by Dan Carter, which includes the SEEC final decision, documents of proof, witness testimony letters, correspondence to and from Allie-Brennan, and many other details. 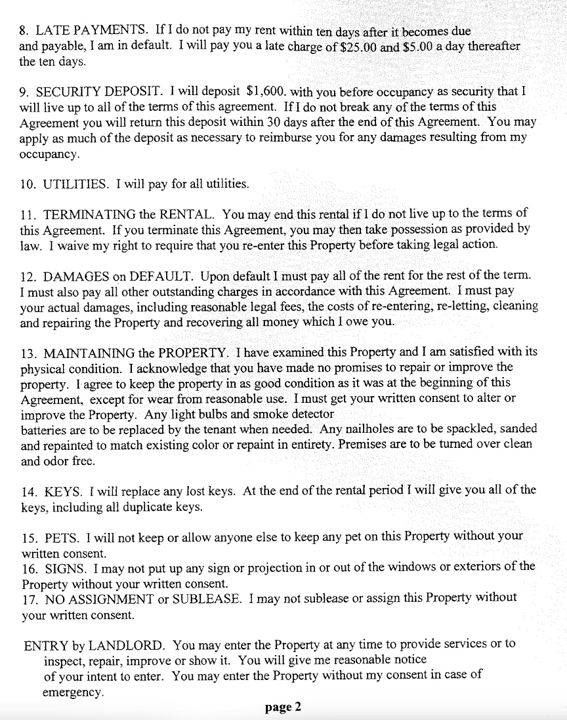 This concerns the matter of a complaint by Daniel Carter, Bethel, File No. 2018-102, Respondent: Raghib Allie- Brennan, Attorney: William B. Smith and Lead Legal Investigator: Gilberto Oyola. After the investigation of the complaint, the Commission issued its “Findings and Conclusions” which is a six page document. 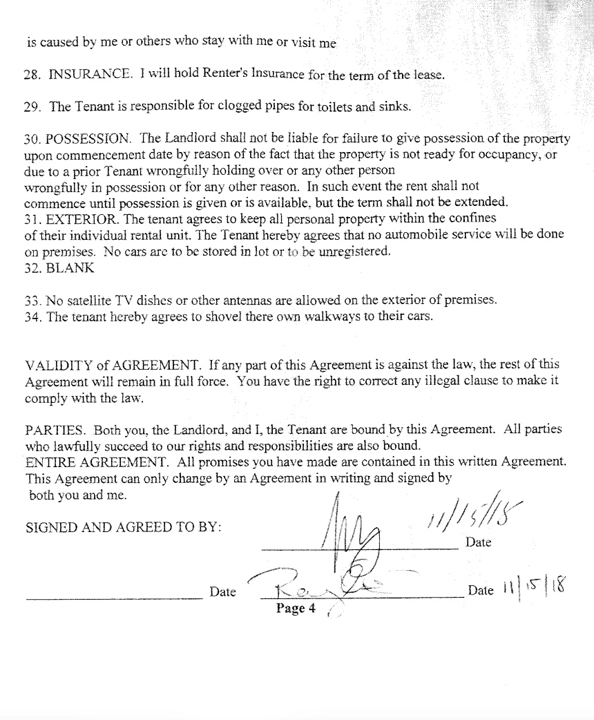 This included a detailed explanation of the complaint, components of the CT State Statutes 9-12, 9-172 and 9-360, and other details regarding documents Raghib Allie-Brennan signed during the period in question, and explanations of the final decision. 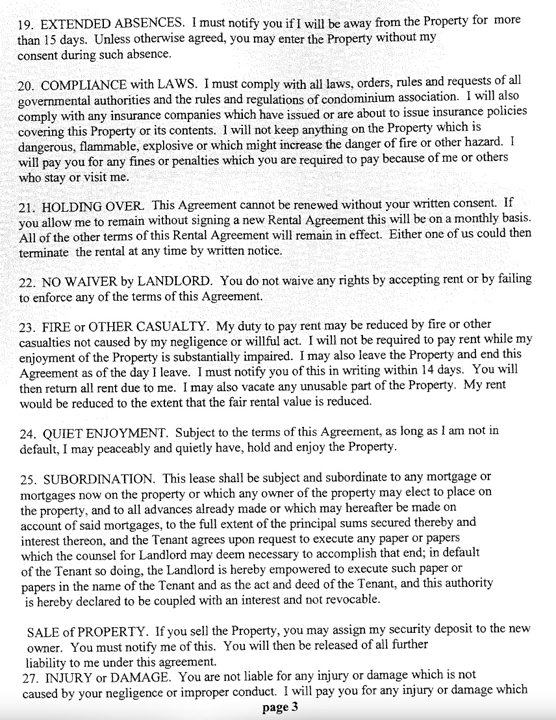 The final decision: “The Commission dismissed the allegations that served as the basis for this complaint against Mr. Allie-Brennan because they were not substantiated by the application of the law to the facts in this instance,” reads the final SEEC decision regarding Dan Carter’s SEEC complaint pursuant to CT General Statutes Sec. 9-12 Who may be admitted, Sec. 9-170 Eligibility to vote at town elections, and Sec. 9-360 Fraudulent voting, File No. 2018-102. 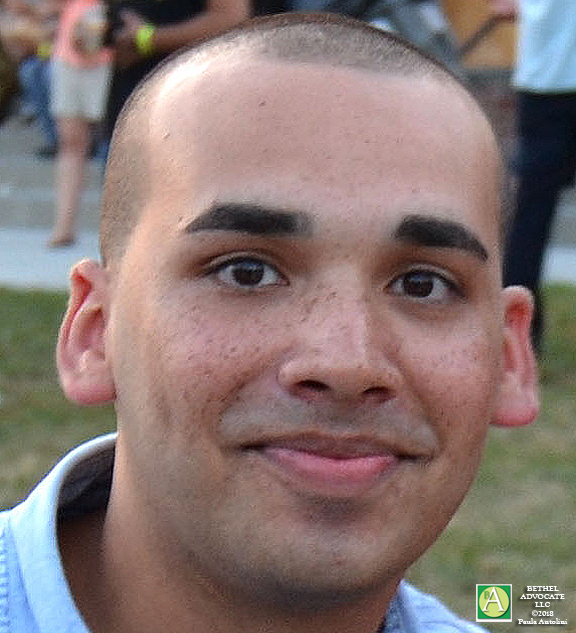 “The SEEC investigation was thorough, accurate, and clearly establishes that to be a bona fide resident one only needs to be able to receive some mail, and keep enough furniture at a property to sleep. “Given the fact that there’s significant state resources invested in legislative elections, lawmakers and regulators should address the existing loopholes that expose the state to fraud. (5) Eleven checking account statements from the periods covering December 16, 2017 through November 18, 2018 addressed to Mr. Allie-Brennan at 9 Cross Hill Road. The five witnesses in this case for Allie-Brennan were Mr. Allie-Brennan’s parents Imtiaz Allie and Serena Allie, his employer Joseph Pastore, a neighbor Danielle Scolpino, and the listing agent of the 9 Cross Hill property in Bethel, Kayanne Vibbert. Their testimony was in the form of letters to the Lead Legal Investigator Gilberto Oyola. 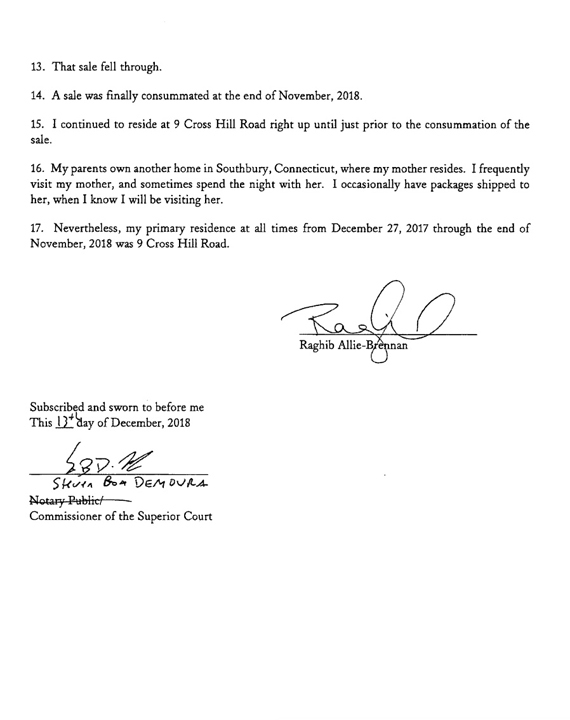 Allie Brennan’s mother Serena Allie wrote in her letter of testimony to Oyola (not dated) that “Although I wish my son lived with me in Southbury he resided at our former family home at 9 Cross Hill Road at the time of his filing to run up until after the 2018 election.“ Serena Allie also claims that, “Raghib sometimes had packages sent to my residence in Southbury, especially during the Christmas season, which is why his name may appear at this address in a google search.” This statement refers to Google search results, such as the Google research results Bethel Advocate showed in the original article where Raghib Allie-Brenna’s name was listed on Google as living in Southbury. View entire letter below. 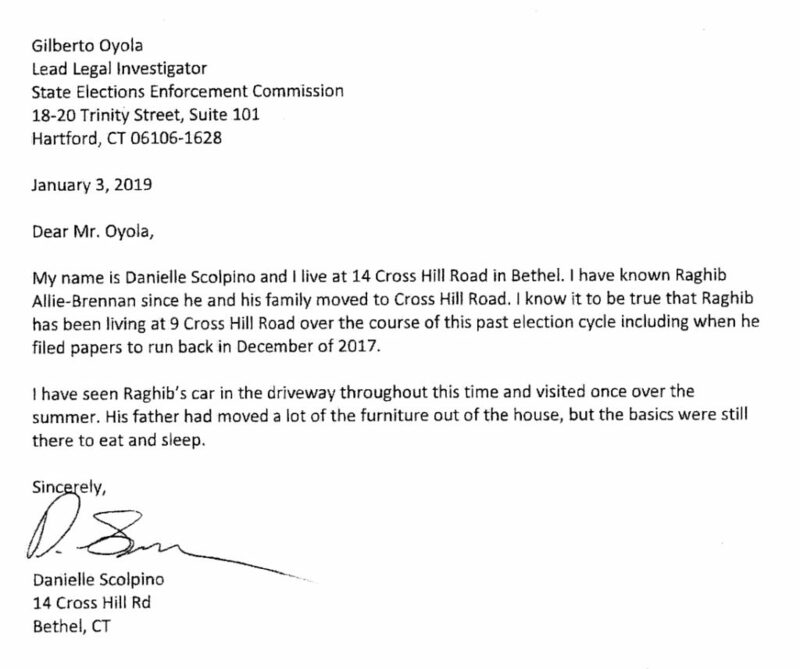 Allie Brennan’s neighbor Danielle Scolpino, wrote in her letter of testimony to Oyola (not dated) that, “Raghib has been living at 9 Cross Hill over the course of this past election cycle including when he filed papers to run back in December of 2017.“ View entire letter below. 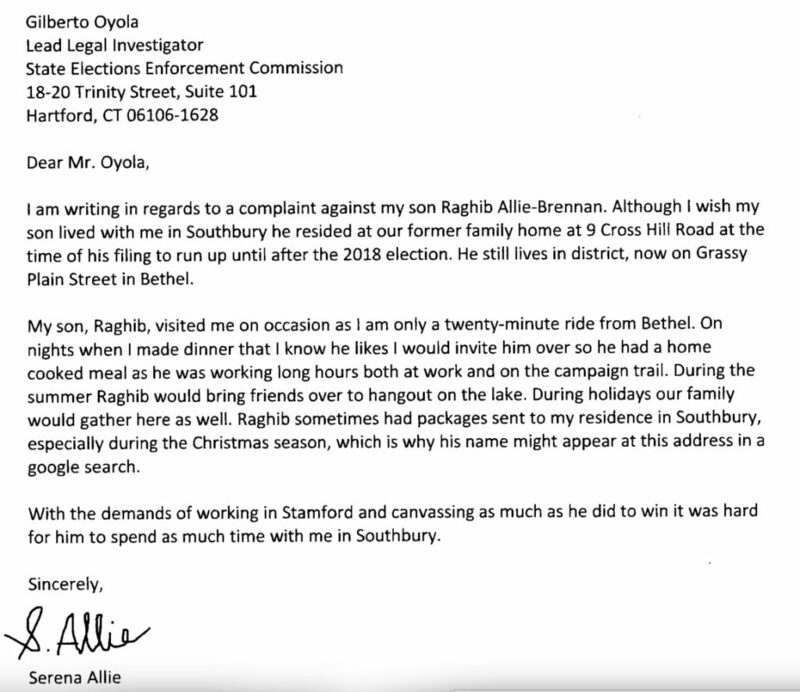 Allie Brennan’s employer Joseph M. Pastore III, wrote in his letter of testimony to Oyola that, “Raghib Allie-Brennan has been an employee with our firm Pastore & Dailey LLC since the fall of 2016. 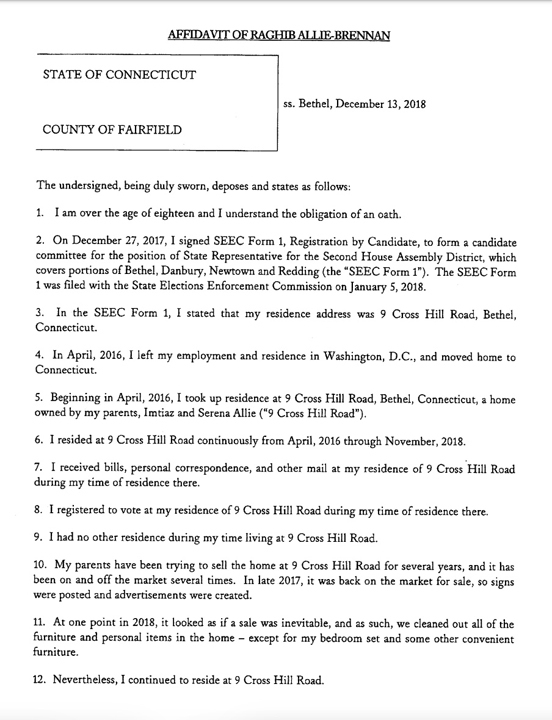 Throughout this time Raghib has provided us with documentation for taxes and other purposes using his home address of 9 Cross Hill Road in Bethel.” View entire letter below. 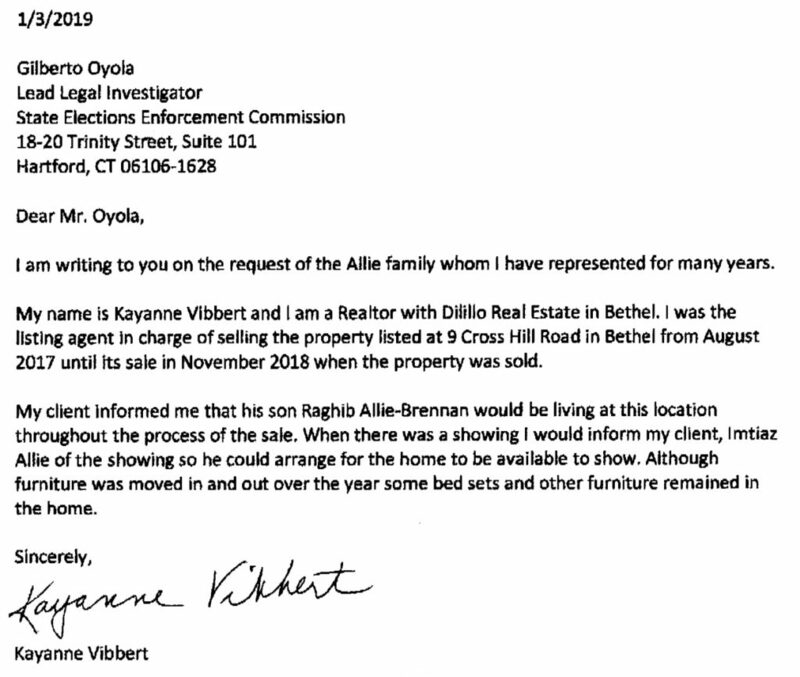 In Kayanne Vibbert’s (the listing agent for the home located at 9 Cross Hill Road in Bethel CT) written testimony to Oyola on 1/3/19, Vibbert wrote, “I am writing to you on the request of the Allie family whom I have represented for many years … I was the listing agent in charge of selling the property at 9 Cross Hill Road in Bethel from August 2017 until its sale in November 2018 when the property was sold. My client informed me that his son Raghib Allie-Brennan would be living at this location throughout the process of the sale. When there was a showing I would inform my client, Imitiaz Allie of the showing so he could arrange for the home to be available to show. Although furniture was moved in and out over the year some bed sets and other furniture remained in the home.” View Vibbert’s entire letter below. The Bethel property sold on 11/14/18 according to the price history (click on “price history” to view) on Zillow.com. Mr. Allie-Brennan’s addresses are listed as 26 Grassy Plain Street, Apt. 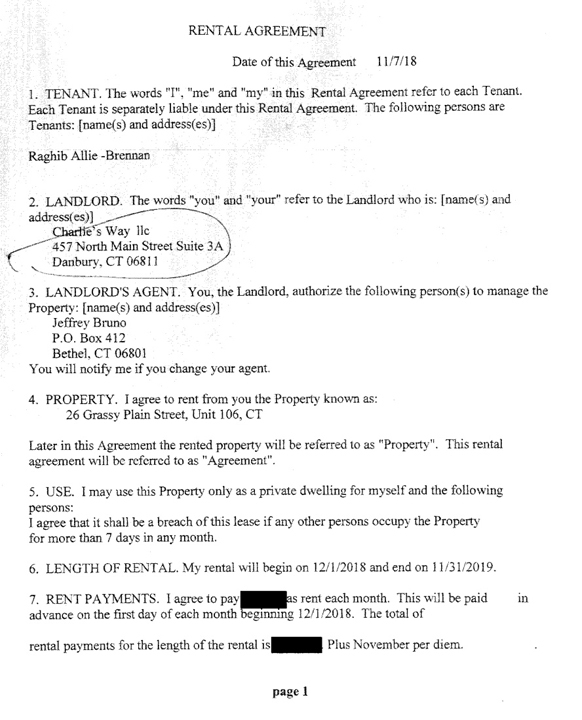 106, Bethel, CT (on a letter to Oyola dated December 13, 2018, on Eversource bills 1/7/19, and on a lease from Charlie’s Way LLC, 457 North Main Street, Suite 3A, Danbury CT with Landlord’s property agent/manager Jeffrey Bruno, PO Box 412, Bethel, CT); 645 E St., Washington, DC (Verizon bills Oct. 24, 2018-Nov. 23, 2018, Nov. 24, 2017-Dec. 23, 2017), a rental agreement on 11/7/18 signed on 11/15/18, rental for the period of 12/1/18 to 11/31/19). Also 9 Cross Hill Road in Bethel, CT (is listed on a 4/13/18 insurance bill “effective 4/13/18” and “expires 10/13/18”; on eleven Wells Fargo Way2Save bank statements covering 12/16/17 to 10/18/18; on an Aetna Insurance card 10/19/18; on a Foremost Insurance Company statement 4/13/18; on a W2 form from 2017; a Town of Bethel Car Tax bill paid 2/1/18 for a 2002 Grand Ch jeep, and another Town of Bethel Car Tax bill for a 2002 Grand Ch jeep, paid 7/31/18). On November 5, 2018, former CT State Rep. Dan Carter filed an SEEC complaint pursuant to CT General Statutes Sec. 9-12 Who may be admitted, Sec. 9-170 Eligibility to vote at town elections, and Sec. 9-360 Fraudulent voting, File No. 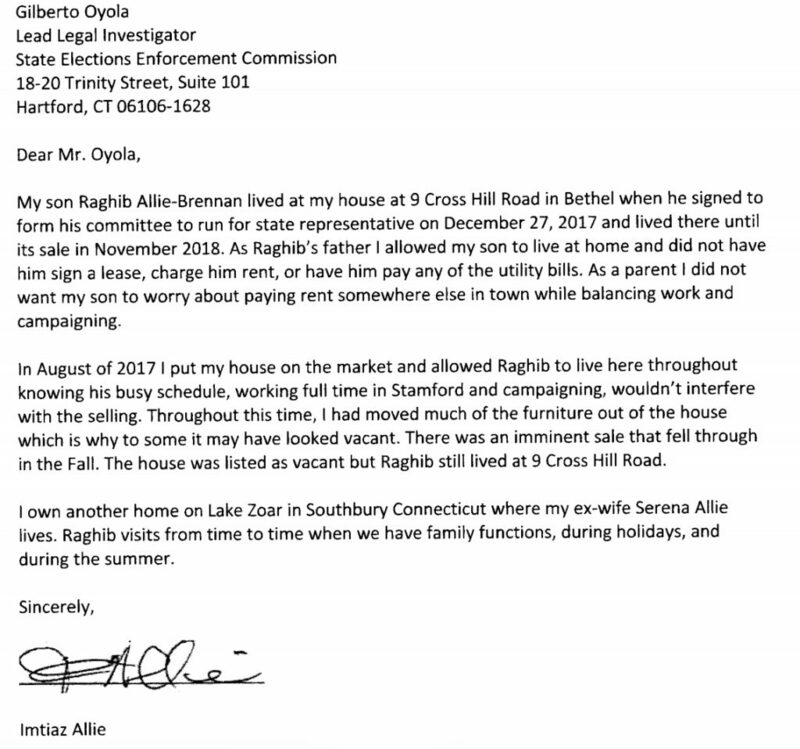 2018-102, against then candidate for State Rep. Raghib Allie-Brennan, alleging that he violated election law by registering to vote where he was not a “bona fide” resident, and related violations regarding his registering a candidate committee and running for elective office from a “vacant home,” as stated in the SEEC “Findings and Conclusions” document. Pursuant to CT State Statute 9-7b, the Commission had one year from the date the complaint was received, to resolve the matter, according to a letter sent to Allie-Brennan on November 30, 2018, by Oyola. We will update this article as more information is received.